Nobel Prizes are rarely awarded on the spur of the moment. There is normally some maturation time until it is considered appropriate to distinguish a finding that was achieved years, sometimes even decades, earlier. But the Nobel Prize in Physics 2013 was one of the exceptions. In July 2012, researchers at the European Laboratory for Particle Physics (CERN) in Geneva reported the discovery of a long-sought-after particle, the Higgs boson. Fifteen months later, the Royal Swedish Academy of Sciences announced the award of the Physics prize to Peter Higgs and François Englert, authors of the theory that postulated the existence of this particle. No one was surprised by the news that seemed rather self-evident. Following the announcement of the discovery at CERN, the popular theoretical physicist Stephen Hawking was in favor of granting the award to Higgs, even though it meant Hawking losing a bet of $100. 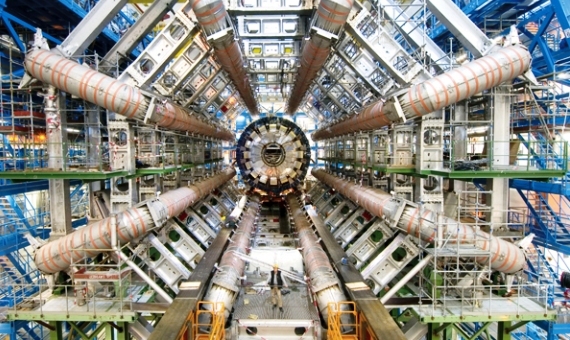 But overall, few would have doubted that it was an act of justice to reward the success of the most expensive and grandiose machine in the history of science, the Large Hadron Collider (LHC), the largest particle accelerator in the world, whose construction cost about three billion euros and which extends its 27-kilometer loop between Switzerland and France. The discovery of the Higgs boson explains the origin of the mass of all the visible matter we know, thus putting the finishing touch on what is known as the Standard Model. The main significance of the find is to complete and ratify the framework on which theoretical physicists have based their predictions for decades, and it is precisely this confirmation that is the reason for the disappointment of Hawking, who promised a more interesting scenario for theorists if the so-called “God particle” ever manifested itself. 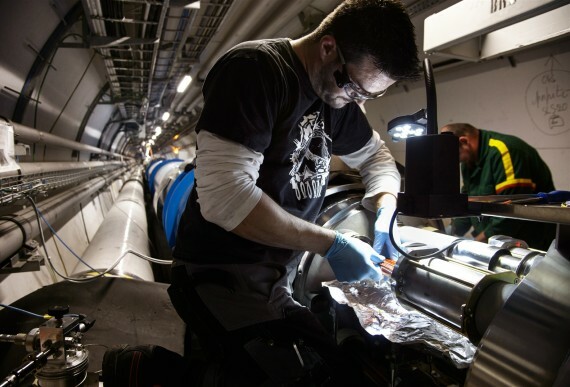 Although the most sought-after object of the LHC was found in its first round of operation, this doesn’t mean at all that the accelerator has lost its raison d’être. In fact, according to CERN researcher Fabiola Gianotti, “the discovery of the Higgs boson was only the beginning of the journey of the LHC.” But after three years of operation, the machine was in need of care. In February 2013, the technicians disconnected it and subjected it to a thorough process of maintenance and updating that lasted 16 months. Finally, in June 2014, CERN announced that the LHC will be activated again in 2015 for a new round of three years of research. That same month, engineers finished connecting the superconducting electromagnets that guide the proton beam along the ring to make them collide, a task that according to CERN is “like shooting two needles a distance of ten kilometres away with such precision that they meet halfway.” To accelerate the particle beams to nearly the speed of light, the magnets must be cooled with liquid helium to -271.3°C, a lower temperature than found in outer space. Between February and March, the first proton acceleration tests will be undertaken with a view that on a date still to be determined, but that CERN estimates for May, collisions will start to be produced in the four detectors or major LHC experiments, respectively called ATLAS, CMS, ALICE and LHCb. What will these new discoveries be? According to the head of the Theory Unit of the Physics Department at CERN, Ignatios Antoniadis, the energy levels the LHC will reach are going to leave the Standard Model behind and enter uncharted territory. At the end of the day, if the Higgs boson is responsible for the origin of mass, this only applies to visible matter, which is only one-fifth of all the matter in the universe. The rest is dark matter, as unknown as its name suggests; a mystery, according to Antoniadis, that could unravel if the LHC manages to detect WIMPs or weakly interacting massive particles, his hypothetical candidates. But the new physics at the LHC could reveal the answers to more questions. Among their collisions may be found, among other things, evidence of supersymmetry, a theoretical property of nature that could pave the way for that holy grail of physics with the same name as the recent biopic about Stephen Hawking: The Theory of Everything.